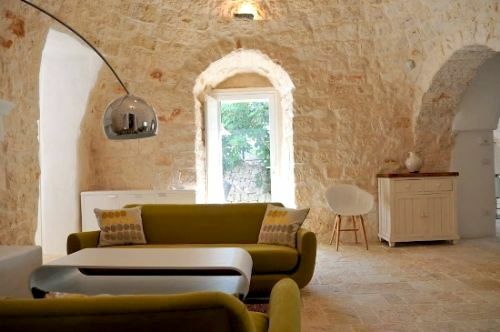 Who would guess that funky furnishings and designer flair awaits families within the whitewashed stone walls and beneath the pointy, pinnacle rooftops of this ancient Puglian Trulli? 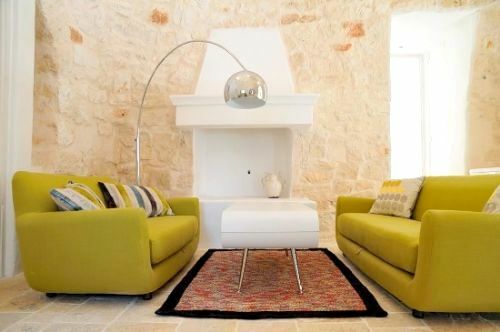 Although a 200-year old farm building, owners, Sharon and Henrik have brought their 3-bedroom trulli bang up the date with a sophisticated, minimalist makeover that lets the original character really shine through and combines simple luxury with high spec mod cons. Young and old will be enchanted by the cool, cave-like interior of conical vaulted ceilings and honey-stone walls, floors and archways, whilst the clean lines and absence of clutter is incredibly calming and conducive to chilling out. 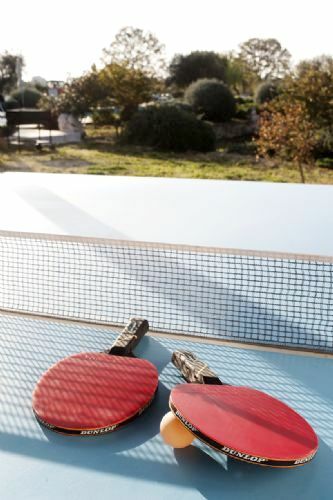 But it’s not just the style of the villa that gets the BFB thumbs up because the owners have also well equipped their trulli for little ones, from all the essentials for feeding, bathtime and bedtime, to a ‘baby box playpen’ of 70 coloured balls, floor puzzle mat, soft block set, children’s DVD’s and more. The contemporary kitchen is well-equipped for family self catering and there is a TV, iPod dock and amazingly good wi fi, both inside and out, to satisfy digital natives. The friendly housekeeper, Imma, will always be happy to help with whatever families need, from pre-arrival shopping to home-cooked ready meals and pizza making lessons for children can also be arranged. Stepping outside the villa, families will be just as wowed by a beautiful pool with stunning views of the hills beyond, shady pergolas for eating outdoors and a Mediterranean garden where children can play amongst fig, olive and walnut trees. The 12x4m salt-water pool is quite shallow all the way across and has steps for easy access, where toddlers can splash around with parents. A paddling pool, arm bands and pool toys are also provided as well as a play house and trikes to keep children happily occupied while parents catch forty winks in the sun. 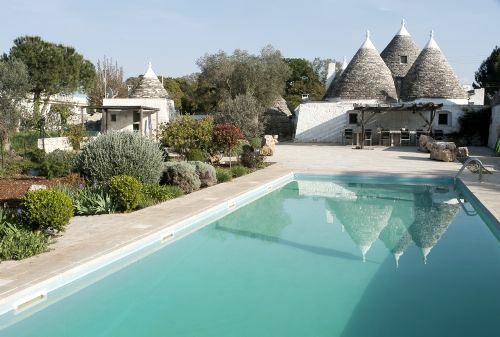 This villa comprises five of the distinctive, conical trulli towers which have been beautifully converted into a spacious, 3 bedroom escape for up to 6 people plus up to 2 babies in cots. 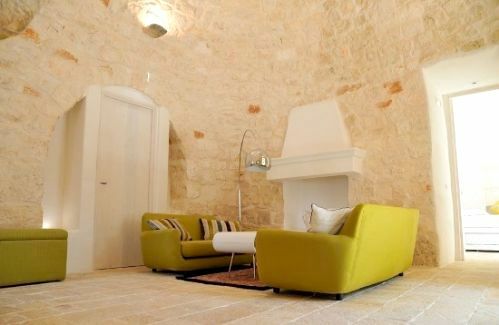 The exposed stone walls and high, glass-domed ceilings, make the villa feel wonderfully airy and there is a large fireplace in the sitting room, where families can get comfy on a pair of funky sofas and watch TV, DVD’s or listen to music through an iPod. The contemporary kitchen, in stone and wood, is fully fitted with modern appliances, including a gas hob, oven, dishwasher, microwave and coffee machine, plus there are all the accessories families could need, from a food processor and hand blender to a bottle heater, bottle steriliser, plastic crockery and cutlery. A separate utility room with sink and washing machine is situated outside the house. The dining area has a modern glass table and six designer chairs, plus one high chair is provided and another can be attached to a chair. The villa has three bedrooms, comprising one with a king-size bed, one with a queen size bed and one with a single bed that has a pull out bed underneath to make a twin room if required. The master bedroom has an ensuite shower room and there is a separate bathroom, both finished in contemporary porcelain, stone and wood. Both the double bedrooms have space for a cot, as well as the third bedroom if set up as a single, and two travel cots are available. Doors from all the rooms open to an inner courtyard and a stone dining table in a pergola overlooks the surrounding hills and Valle d'Itria. 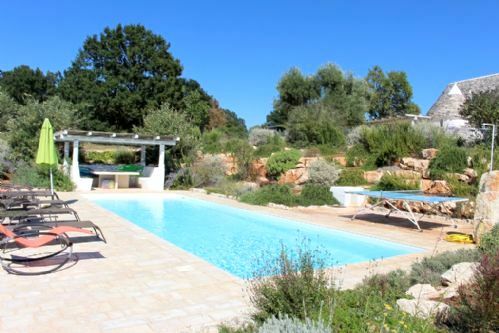 A stone path winds down to the fenced, 12m x 4m pool and there is a poolside gazebo with a stone dining table. A field surrounding the pool has been landscaped with Mediterranean plants and children can play in the shade of fig, olive and walnut trees. Sleeps up to 6 + infantss in 1 x king size bedroom, 1 x double bedroom and 1 x single room with trundle bed. Bari is just 1.25 hours, and Brindisi is 45 minutes drive away. Lovely sandy beach just 25 minutes drive away. Nearest supermarket is just 1 mile away and the nearest town 1.5 miles away. 12mx4m, shallow throughout, entry steps, fenced and gated within garden. Babysitting and Daytime Childcare available 7 euros per child per hour. Two travel cots, one highchair and one highchair which can be attached to chairs (therefore mobile if required), steriliser, baby monitor, bed guards, socket covers, plastic crockery, plastic cutlery, 2 sippy cups, 2 spare baby bottles, linen for both cots, bottle heater, potty, mattress protectors, night lights, stroller with sleep position and an integral shade cover, changing table with baby bath. Books, DVDs, 6-18 month soft block set, baby box with 70 coloured balls, plastic mobile for 3 months upwards, floor puzzle mat. Pre-arrival shopping available, meals can be prepared by locals. Nappy (need size), formula and baby food in jars (give us your preferences), wipes can be purchased in addition to other pre-arrival shopping. 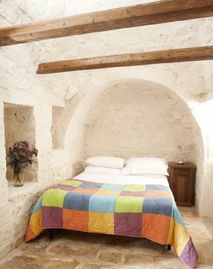 You will pay Imma, the Trullo's housekeeper directly, there is an additional 15 euros charge for this service. Buckets and spades, trike, paddling pool, play house, selection of arm bands and pool toys. Manicurist/pedicure/massages available from local beautician. Private gardens with pool, BBQ shaded dining area and fire pit in the courtyard area. Resident chickens can be found in the grounds. Extra cleaning can be arranged. Fire pit in the courtyard.